The OMG-COMM232-EX is a PC bus plug-in card based on the 16550 FIFO buffered UART, which is compatible with the standard 8250. 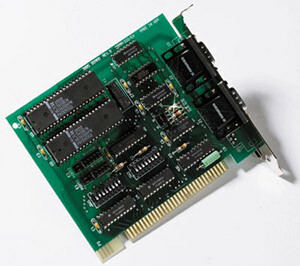 This dual channel asynchronous serial communication card utilizes the RS-232 specification to provide RS-232 communication capabilities to your application. Selectable and sharable extended 'AT' interrupts increase the OMG-COMM232-EX versatility. Signals are transmitted and received via two 9-pin sub-D male connectors. Bit character lengths of 5, 6, 7 or 8, and odd, even or no parity are all available. The advanced COM drivers for Windows 95/98 and NT are included, which provide IRQ sharing, advanced UART support, and Windows serial diagnostics. Windows 3.1x drivers are available for more than 4 COM ports. 참고: Comes complete with operator’s manual and software driver.